Is Your Sales Pipeline Full Or Just Full Of It? How Many Sales Reps Should You Fire This Year? The Sales Funnel Is Dead: What’s Next? Is Sales Enablement Worth It? What Is Account Based Marketing and Is It Right for Your Business? Which Sales Compensation Plan Is Right for Your Business? Planning For 2019? 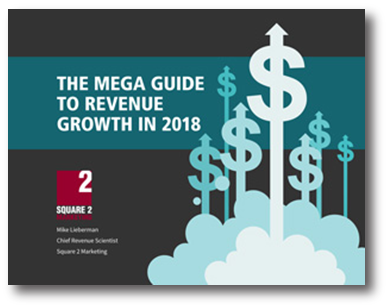 Are You Stacking Marketing, Sales And Service Revenue Growth? Content Marketing In 2019: What Major Changes Are Coming Your Way? How Long Does Inbound Marketing Take to Work? Does Your 2019 Planning Include Marketing, Sales AND Customer Service Revenue Generation? Is Influencer Marketing on Its Way Out? Brand Storytelling Vs. Content Marketing: What’s The Difference? What Is A Revenue Cycle? Do You Know Your Revenue Cycle Numbers? [Infographic] Is Your Email Subscriber List up to Scratch? The Revenue Growth Checklist: Are You Ready To Grow Your Company? Do You Want Your Company To Grow? Are You Ready To Do Whatever It Takes To Grow? Should You Expect Tricks Or Treats From A Diamond-Tier HubSpot Partner Agency? Boo! Are You Scared To Work With A Digital Marketing Agency? Ask Them To Guarantee Results! What Is A Revenue Growth Agency? What Are Some Great Selling Techniques in Today's Digital Age? How Is Demand Generation Different From Inbound Marketing? I Hate Cold Calling. What Should I Do Instead? What Is The One2One Methodology For Driving Customer Relationships At Scale? Want Leads But Lack Budget For Marketing? Fire Your Worst Salesperson! HubSpot CRM Vs. Salesforce: Which Is Right For Your Company? What Will Inbound Marketing Look Like in 10 Years? Marketing Regulations? Coming To America! When Should a Business Invest in Inbound Marketing? So Many New Marketing Tactics, Tools And Technologies, Oh My! How Long Will It Take to See Content Marketing Results? How Does Your Digital Marketing Agency Keep Up To Speed On The Latest And Greatest? Do You Need A Sales Consultant Or A Sales Builder? The Agency Of The Future Is Here Today! Has Your Sales Team Conducted A Client Check-Up Lately? Is Salesforce.com Costing You Too Much Money? What If You Just Can’t Afford A Sales Superstar? Sales Training Versus Sales Enablement – What's The Difference? Is It Time To Put Your Sales Pipeline On A Diet? Is Your Sales Compensation Plan Costing Too Much? Is The Latest Google Update Driving Down Organic Website Visitors? Video Marketing Vs. Written Content: Which Is Right For Your Content Marketing Strategy? What Should I Look for When Recruiting Sales Reps? Where Can Small Business Owners Find Marketing Guidance? What Qualities Do Top-Performing Sales People Have? The Biggest Challenge Facing B2B Marketing Today? Knowing What To Do! What Should You Expect From A Sales Enablement Expert? Are My Competitors Using Digital Marketing? Should Your Company Outsource SEO? Is Your Website Design Hurting You? Where Should I Spend My Inbound Marketing Budget? When Should You Seek Professional Sales Coaching? When It Comes To Revenue, Which Comes First, Sales Process Upgrades Or Marketing Tactical Fixes? What Is a Meta Description and Why Should You Care? Is Marketing And Sales Alignment A Non-Starter At Your Company? [Infographic] What's in Store for Video Marketing in 2018? What Is Revenue Performance Management? What Does Today’s New Revenue Generation Funnel Look Like? Will Facebook’s New News Feed Mean a Jump in Ad Spend? How Do I Know How Much Content Marketing Is Too Much Content Marketing? Do You Know The Quality Of Revenue At Your Company? Are Your Sales Reps Good at Their Jobs? Do You Know How to Effectively Recruit Sales Reps? Is Facebook For Digital Marketing Dead As We Know It? Will Millennials Kill Cold Calling? Short-Term Leads Vs. Long-Term Marketing Strategy: What's Right In 2018? Branding Vs. Direct Response? Which Marketing Strategy Is Right? Is Your Blog Destroying Your Customer Relationships? What Were the Biggest Social Media Trends of 2017? What Should My Budget Be for Sales Enablement? Why Run a Proof-of-Concept Pilot Project? Will Artificial Intelligence Cause Sales Roles to Disappear? [Video] What Are Pillar Pages and Why Do I Need Them? [Infographic] Is Your Website Built for Conversion? Is Your Sales Trainer Failing You? Is Your Content Marketing A Step Ahead Of The Pack? Are You Using HubSpot to Its Full Potential? Are You Following Up Correctly On Your Inbound Marketing Leads? Need Help with a HubSpot Problem? To ABM Or Not To ABM: Is Account-Based Marketing Right For You? Why Engage Buyers before They Talk to a Sales Rep? Should Your Sales Manager Be Sales Coaching? What Expertise Do I Need to Build an Effective Inbound Marketing Strategy? Why Is My Website Design And Development Project So Expensive? SalesHub Wins HubSpot Grand Prize Impact Award for Sales Enablement for the North American Region for 2017! Marketing Consulting Firm vs Inbound Agency: What’s the Difference? Fire Your Sales Team Today! What Is a Hybrid Content Marketer? Is Your Sales Compensation Plan Contributing to High Turnover? Are Your PR and Marketing Strategies Aligned? What Is Agile Marketing, Really? Why Choose a Sales Platform Over Sales Tools? Struggling to Increase Sales but Not Sure What to Do Next? How Much Lead Nurturing Is Too Much Lead Nurturing? How Can Social Publishing Improve Your Business? Having Trouble Executing Your Inbound Marketing Strategy on Your Own? What Is the HubSpot Inbound Marketing Methodology? How Can a Marketing Consulting Firm Improve My Business? What Is Inbound Marketing and What Is HubSpot? How Can Inbound Marketing Increase Sales Efficiency? DIY Inbound Marketing: Does It Work? Does Lead Nurturing Increase Sales? How Exactly Does Inbound Marketing Increase Sales? HubSpot vs Salesforce: Which Should I Get? Why Is Social Media So Important and What Can You Do about It? What’s a Growth Stack, and Why Does Your Company Need One? Does Your Business Have a Growth Stack? Inbound Marketing Best Practices: Produce Content In-House Or Out-Of-House? What Is Inbound Marketing vs Outbound Marketing? How Does Traditional Website Design Compare to Inbound Marketing Website Design? Do You Need A Marketing Technologist To Run Demand Generation Campaigns? What Can Sales Enablement Tools Do for Business? Is a Bad Sales Email Costing You Clients? What Is the HubSpot Growth Stack? Content Marketing Tips: Can Quality Content Captivate Your Customers? How Does Inbound Marketing Play In A Demand Generation Marketing Strategy? Is Revenue Optimization The Future Of Marketing? Wondering What to Do When Sales Are Down? Why Is Social Media So Important for Businesses Today? Do You Prioritize Sales Training? Is Your Inbound Marketing Effort Growth-Oriented? Does Your Team Have 10,000 Hours Of Inbound Marketing Experience? What Should You Do If You Missed, Just Made Or Exceeded Your First-Quarter Revenue Targets? Is Inbound Marketing Quickly Going 'Out Of Style'? Direct Mail Gets An Upgrade From The USPS: Digital Marketing Plus Or Minus? Sales Training vs. Sales Enablement: What’s the Difference? Demand Generation Vs. Inbound Marketing: Which Is Right For You? Why Is Sales And Marketing Alignment All Of A Sudden So Important? What Do Results From An Inbound Marketing Program Look Like? If You're Doing Demand Generation, Can You Do Inbound Marketing Too? HubSpot Vs. Marketo, Pardot And Eloqua: Which Marketing Automation Tool Is Right For You? Where Do You Get Your Inbound Marketing Advice, Guidance And Ideas? Why Is Marketing Strategy And Messaging Critical To Lead Generation? What Is Marketing Strategy When You're Talking Demand Generation? Inbound Marketing For Industrial Manufacturing: How Does It Work? Are Your Salespeople Sending out Boring Sales Emails? What Does a Marketing Consulting Firm Do? Does Your Sales Team Know How to Use LinkedIn?